2018 Small Lot Collection by Russell Joyce, Gamay Noir, San Benito County, California. Winemaker Russell Joyce of Monterey’s Joyce Wine Company has branched out to explore with an exciting new personal project and label focusing on interesting vineyard, varietal and or unique blends and has bottled his initial debut with a stylish 2018 single vineyard Gamay Noir that will be released early this Spring of 2019 and it’s a killer wine. Inspired by the wines of Lapierre, Foillard, Sunier, Dutraive and others making thrilling Cru Beaujolais Russell has been searching for a few years to find a true Gamay Noir vineyard to source from that offered distinct and classic flavors, and he found it in a small parcel of vines in San Benito County, though he is keeping a secret as to its exact location, with good reason as this might be the best California version I’ve tasted, right up their or better than wines like Pax, Raj Parr, Arnot-Roberts as well as with those great examples by Oregon Gamay heros like Brick House and Bow & Arrow! Russell went for a natural approach with 100% whole cluster and full on carbonic maceration in a sealed stainless tank with native yeasts before raising in just 4 months in neutral French oak barrels, with only the tiniest of a dose of sulfur, to allow for purity, freshness and transparency. This 2018, which I tried from tank, cask and now bottle (tasted four times) is going to rock those lucky few that get it, as only 200 six pack cases were made of this inaugural vintage. This Gamay shines in the glass with a beautiful ruby/garnet hue and bursts on the palate with varietal force showing sweet plum, juicy red berry and candied cherry/strawberry fruits with just a hint of jolly rancher and cotton candy along with some nervy stemmy/herbs, spice, with air it gains a hint of chalk and mineral without any trace of wood, this is wildly impressive first time effort with this grape in a red wine, though Russell does use some Gamay in his Joyce Rosé and has for a few vintages, and the packaging is gorgeous in a nod to the great wines of Morgon with a simple label and a small bright red wax capsule. 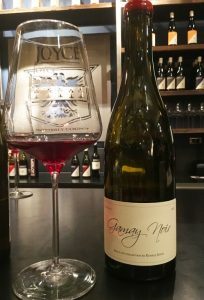 This ultra vivid small lot Gamay will be highly allocated, but if you are interested in getting some, you can beg to be put on the list if you visit the Joyce Vineyards tasting room in Carmel Valley or by emailing Russell at info@joycevineyards.com, there is a strict limit of up to 6 bottles for those on their mailing list as supplies or pre-arrivals last. Joyce is riding high right now with a fantastic selection of current releases, especially his 2017 single vineyard Pinot Noirs and his 2017 Tondre Syrah, a dry and lush Chenin Blanc from Massa Estate, the former historic Durney Vineyard in Carmel Valley, along with a set of refined neutral oak aged Chardonnays, with his new Escolle Vineyard, Santa Lucia Highlands version drinking fantastic too. Gamay freaks, like me, are going to want this flamboyantly intriguing, vibrant and clean example, it should be fantastic on release and has all the right stuff and fruit core to age, and it should develop a more savory/earthy character with another few years in bottle if you had the patience to do so, which I doubt as this stuff is so damn good and quaffable even right now.